One person will win Far from the Madding Crowd on Blu-ray. I like the movie Love Story. Love Actually, Pretty Woman and Return to Me are favorites of mine. This movies is amazing, I loved it! The Princess Bride is my favorite. It's hard to pick Just One romance movie - my favorites are The Notebook, The Way We Were, and Return to Me. The Man in the Moon...kind of a coming of age romance story with a young Reese Witherspoon. Broke my heart when I first watched it many years ago! One of my favorite romance movies is Urban Cowboy. My favorite romantic movie is Love Actually, followed by Pride and Prejudice. My favorite romance film is 'the French Lieutenant's Woman'. The Notebook would have to be my favorite romantic movie! I like My Man Godfrey. I feel like I equally love Pride and Prejudice and A Walk to Remember. Big Fish, it is not technically a romance movie, but it has a great love story in it. One of my favorite movies of all time. My favorite romance movie is the Titanic. In the Mood For Love. Thanks for the chance! I'd pick The Notebook. thank you!! P.S. I love You is my favorite. My favorite is Wuthering Heights with Tom Hardy. I hated the book the first time I read it but after watching the film and reading the book again several times, it has grown on me and is now my favorite. 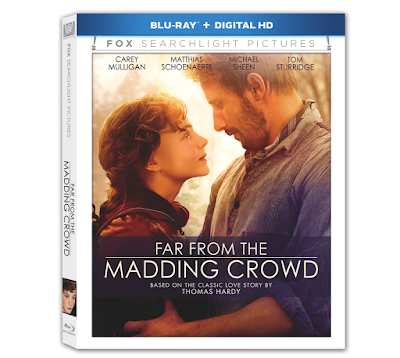 I'm a sucker for the classics and read Far From the Madding Crowd last December. My all-time favorite romantic movie is Sleepless in Seattle. My personal favorite is "Once" -- love the story, the music, and the two lead characters in that film so much. My favorite romance movie is Titanic. 'It Happened One Night' and 'When Harry Met Sally' are two of my favorites. Green Card, Love Actually, and Sense and Sensibility are my favorites. The Notebook will always be my favorite! I like Cocktail with Tom Cruise and Elisabeth Shue. I heart "Take This Waltz". My fav is a romcom and it is 50 1st dates. Casablanca is my favorite romantic movie. One of my favorites is Strictly Ballroom. I love Sleepless in Seattle!